As often happens, police fired upon and killed an unarmed citizen last week. Because this occurred in Ferguson, a suburb of St. Louis, MO, the local population rose in anger resulting in protests, riots, looting, and a brutal crackdown by the militarized local police. I can't locate incorporation data for Ferguson. 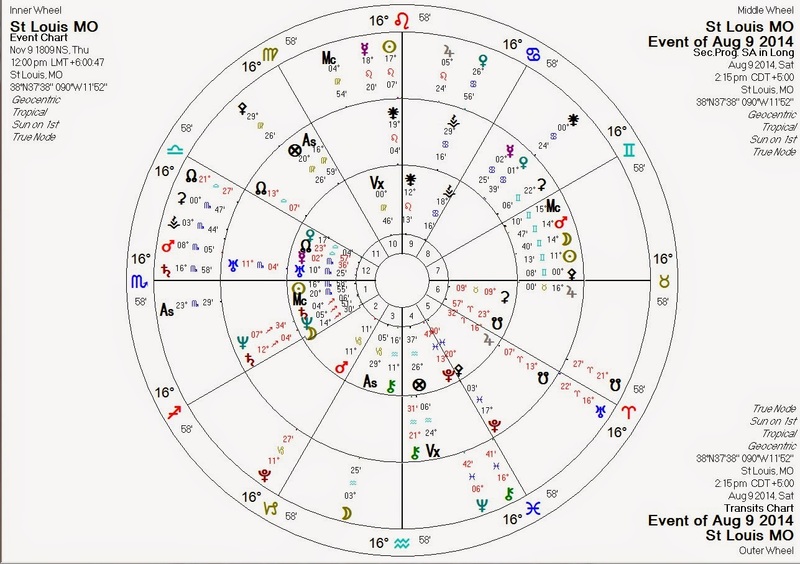 However, transits and progressions during the Michael Brown shooting against the chart (time unknown) for St. Louis are extremely descriptive of recent events. Transiting Pluto conjunct St Louis Mars (ruler of Sun/Mercury/Uranus): Powerful activation of potentially violent energies. Transiting Pluto approaching quintile with St Louis Pallas: bad judgment, authoritarianism, violence likely. Transiting Neptune square St Louis Neptune: confusion/disillusionment? Transiting Uranus conjunct St Louis Jupiter: Sudden unexpected publicity. Transiting Saturn conjunct St Louis Sun: Struggle, possibly with/against authority. Progressed Moon conjunct progressed Mars: conflict (Mars) involving population and/or race issues (Moon). Because there is no time for the St Louis incorporation data, the "natal" and therefore the progressed Moon can be off by up to almost seven degrees... however, this conjunction makes something of a case for rectifying the incorporation time for around noon. Transiting Mars conjunct St Louis Uranus: setting off (Mars) popular rebellion (Uranus). Note that the St Louis chart has Pallas conjunct Pluto: violence seems more likely here than in many other major cities. Note also Jupiter trine Moon and square Mars: exaggeration/expansion (Jupiter) of violence (Mars) involving race (Moon). Transiting Pallas is starting to get within range of a square with Pluto. I expect more worldwide violence in the coming weeks, peaking about a week into September and then subsiding.